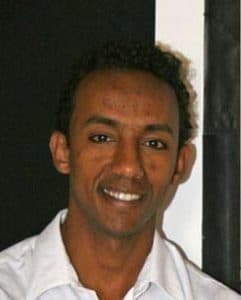 Artist Yosief Abraha exhibited art works at Casa Delgi Italiani here in Asmara from February 12 to 15, 2011. This exhibition with around forty works of collage and water colour attracted a big audience. Some writing on the comment book said that they finally found something they can understand. This statement drew my attention and forced me to think what they meant. Very often exhibition goers are heard complaining they are not for abstract or semi-abstract works. What I then thought was that this exhibition probably brought to the audience what they knew represented artistically; it might also was different with the dominant medium – collage – which is not very common in other exhibitions wherein paintings dominated; and it was only in kindergarten school closing ceremonies that such works were often viewed. Over half of the works Yosief exhibited were collages put up from magazines and a bit of acrylic paint. The realistic presentation of many of the subjects in the works reflects how tiresome it could be to cut out bits of coloured magazines for various details. Speaking of his collage works, artist Yosief said that he had never studied it and never seen it done seriously by his contemporaries. However, his interest goes back to around 15 years when he made a collage post card as a good wish gift to a friend on honeymoon. As that post card became a talk of his cronies then, he gave it a second thought and exhibited his first eight collages in his first solo exhibition in 2002. He made those works in a style of stained glass which he could not do himself then for their costly price. The inspiration for the recently exhibited works came from a work – about 6.4 meters long – Yosief was commissioned to produce by Sunshine Hotel three years ago. This work which he titled “The Street after My Own Heart” is an intersection of six streets in the area known as historic Asmara. The area is very well-known for its art deco buildings and requires one to take long time to notice the breathtaking architecture there. Artist Yosief stated that he decided to use collage medium thinking it would strike people’s attention more than acrylic on canvas that might pass on stale feelings on such a big work. To achieve his goal, he had to collect huge amount of discarded magazines; and working for about a month on this piece his eyes widened their horizon and came to understand what he can do with the medium. Although Yosief didn’t continue with the momentum he had on that work when he broke to study carpentry for some time, the idea incessantly lingered in his mind. Using the magazines left from his first work, he realized his vision that materialized in his latest exhibition. The works featuring buses, noteworthy buildings in Asmara and Massawa and portraits have some elements that force the viewer to focus on things that are usually overlooked. Yosief created his work “Sweet Home” – showing a door and dilapidated wall around it – from a collage of dry paints peeled off his pallet. The deterioration of wall with its coarse texture feels like a real wall. For the artist the door and the wall pass on some nostalgic feelings for they harbour old memories of one’s home. He added that it is common to give directions to one’s home by indicating the colour of the door and wall of our homes; and when they are repaired and painted, the age old memories might be buried for good. The most priced work in the exhibition was another collage and acrylic titled “Love Letter”. The work portrayed a young Hidarb girl gazing far away and an Arabic poem on the right side of the canvas. Although Yosief intended to prepare that by sticking pieces from Arabic magazines, he was not able to get what he needed. Therefore, his friend Suraj – whom Yosief call very resourceful and helpful in his work – came to his rescue with the poem that expresses a lover’s promise to her lover who is away from her. The gazing eyes of the beautiful girl complementing with the poem reveal that her heart is far away from where she is. Comparing his working on collage and water colour for which Yosief is very well-known, he stated that collages can be done in a relaxed mood and in any creative way one wants to do. As he loves water colour, he finishes them in one or two sittings involved emotionally that require him extra focus and/or concentration. With collage, however, the emotion may not exist and one needs to start two or three different works at a time so as to use the piece he can’t use in one work can be used on the others, he indicated. Yosief added that working with water colour gives you hope and can have a grip of what would come out of what one is working on; on the contrary, one may not understand what the collage would look like till it is a finished work. The disadvantage of water colour not tolerating a mistake is a reversal in collage; the writings on magazines can only be used on front view of subjects when one works on realistic representations. As collages can be affected by wear and tear, the artists might be required to use some fixatives or tempera medium to keep them for a long time as they were made first. 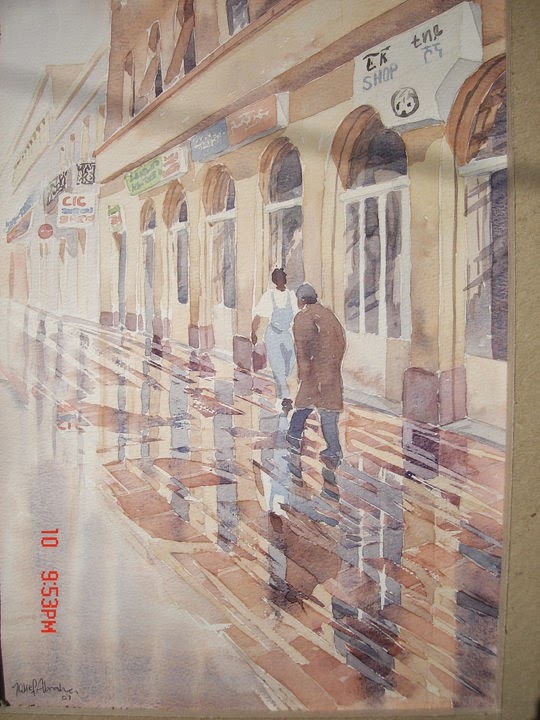 Speaking of why he often paints buildings as his main subjects, artist Yosief explained that buildings reveal to him the behaviours of people who dwell in them. He stated that the way some build their houses, keep their fences, repair their doors show psychological make ups such as defensive, moody, angry, happy…. He went on to say that narrowing down the view of large areas brings out the beauty of some buildings that people might not give a heed and/or showing various buildings collectively as viewed from elevated areas – as he often does by climbing on the bell tower of the cathedral in Asmara – helps people admire the ingenuity of town planners who are artists in their own terms. Artist Yosief, who likes to prepare the technical aspects of his art work (making canvases, cleaning his studio and preparing his tools) and then to get into working for months on a time frame that is not too tight, has used a bit of acrylic paint along with his collages. He used it to get the right colour, to minimize disturbing colours and writings, to get a touch of Eritrean subjects, as well as on spaces, curves and corners where he couldn’t achieve by sticking magazine cuttings. Whatever medium he is using, finishing a certain work had always been the hardest part of his creative endeavours so far, Yosief indicated. He said that one should stop when all his feelings are brought out on the canvas – a comment he got from Yegizaw Michael (Yeggy) and found effective. Thanking him, Yosief stated that Yeggy visiting him at his studio appreciated some works which he had left as unfinished. He added that he used to minimize or add some details on his works for an extended period of time. This difficult part of painting – when to say done to a certain work – Yosief indicated was revealed to him by Yeggy. He also came to understand that stopping when his feelings start to dwindle leaves room for the audience to interact with the work. Yosief concluded that collages transcend borders and have universal appeal more than painting as they can be practised by anyone who is not an artist unlike painting.